A new year, a new perspective, & new challenges. 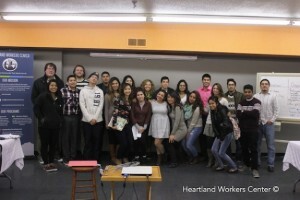 Introducing the Young Nebraskans in Action (YNA), formerly known as the Dreamers Project Coalition. This is the beginning of youth organizing themselves by building relationships to work together to create solutions for community issues, such as driver's licenses for DACA recipients. This is a great start to a great year! Interested in learning more about YNA or want to get involved? Give us a call at (402)933-6095.